As you head for home on a hot summer day, you turn off the loud blistering stretch of concrete that’s Piedmont Road into the neighborhood. The shade of the tree canopy welcomes you, the temperature drops noticeably, it’s quieter, and you think how glad you are that you live here. In fact, one of the main reasons you do live here is because it is an urban forest. Urban forests are important to our quality of life and mental health; they are our contact with nature. Every day in the neighborhood we see joggers, people on a stroll, dog walkers and bicyclists. No need to convince you exercise is better here than in a gym; you already know it. Wildlife – This website is all about urban wildlife, so we could talk about how important trees are to wildlife for a long time. Instead, we put together the following 2-minute video that shows just a small number of the birds and critters that live with us and depend on trees. AS you watch the video below, imagine all of the water from this thunderstorm falling on impervious surfaces instead of the trees and leaf litter below the trees. Plus, it’s much more pleasing to watch and be a part of. Over 10 years ago, we worked with a developer to save several old growth hardwoods on Timm Valley. This builder saw the value of these trees and agreed that they made his property worth more. Before his houses were even finished, the City of Atlanta came in and cut them down to put in a storm drain! Air Quality – Hack! Gag! Cough! That’s summer in Atlanta. 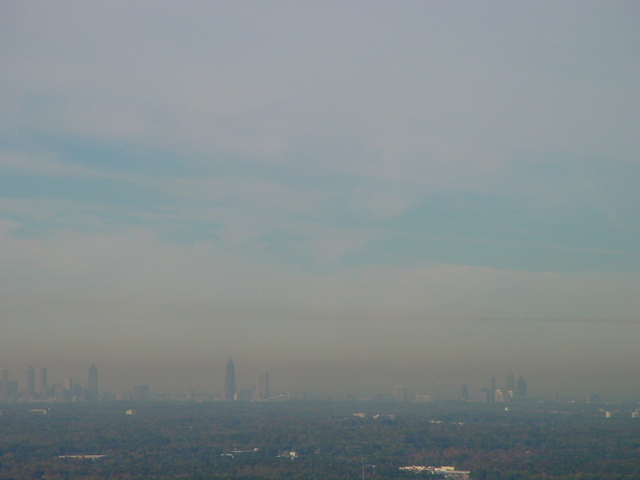 Although Atlanta’s air quality is improving, you can still smell the air and some days you can even see it. Trees breathe in carbon dioxide and breathe out oxygen. Our mature urban forests then make a big difference in the quality of the air we breathe. 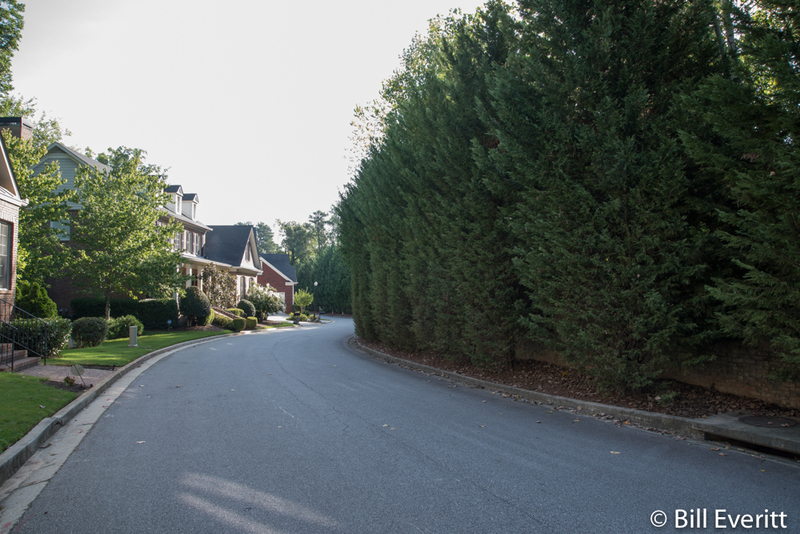 Buffer from Noise – Ever notice that when the leaves are off the trees in the winter this neighborhood is louder? Noise coming from the train, MARTA, GA 400 and Piedmont road all seem to increase. That’s because leaves have lots of surface area that baffle the sound. Much like going to a restaurant where there is sound deadening material, like acoustic tiles or fabric. The folks on Darlington Commons had the right idea when they planted a row of Leyland Cypress to help with noise from MARTA and the train. Not only is their now mature row of trees dense, but the there’s a lot of surface area in the foliage. And, these trees are evergreen, so they provide a noise reduction buffer all year. Energy Savings – We know people in this neighborhood who have allowed a large, deciduous tree close to their house to be removed. We’ve wondered how long it takes to realize that the reason their electricity bill in the summer months has skyrocketed is because all of the shade and evaporative benefits of the tree have also been removed. Large old growth hardwoods and large evergreen pines were removed by a builder from a lot recently. The before and after pictures are shown above. Not only was this to the detriment of the new house being constructed, but the existing houses on either side will be impacted with higher energy costs as well. In other words, in an urban forest, the value of the whole just might be greater than the sum of the parts. That only works if the whole urban forest is protected. Tree Identification – It’s fun to learn what trees there are in your yard. Many are quite old and have seen a lot. Some are evergreen and some are deciduous. Some are native and others are non-native. 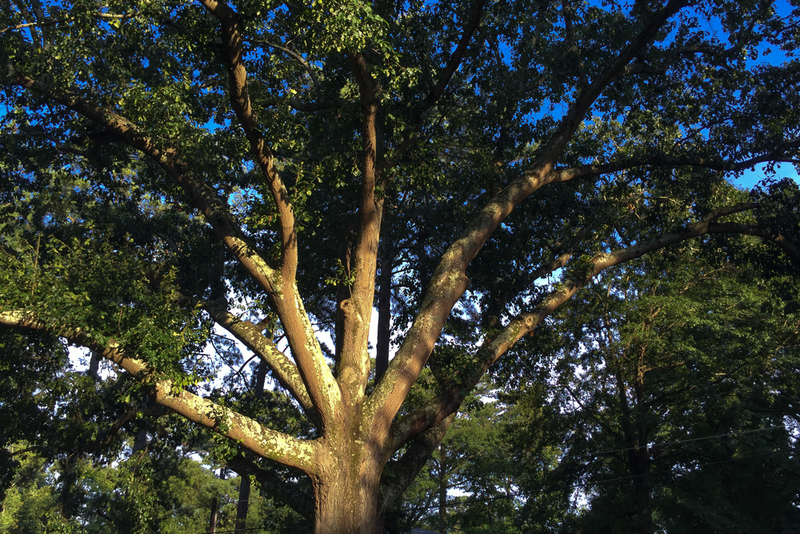 If you are trying to identify a tree, we provide some help with a list of trees commonly seen in Peachtree Park. We are always adding information to this list. You can also get identification help from great websites such as the University of Georgia’s Extension Service, Lady Bird Johnson Wildflower Center and the Missouri Botanical Garden. Size, Age and Special Status – We have a page with information that may help determine your tree’s size and age. Also, some trees carry special status and may be deserving of recognition. Find out about these special trees. If you are thinking of planting a tree, we’ve put together a recommended list of Trees for Your Yard. You can also learn about the importance of natives. If you live in Peachtree Park or any part the City of Atlanta, Trees Atlanta offers up to 3 free yard trees for your front yard, and they will plant them for you.